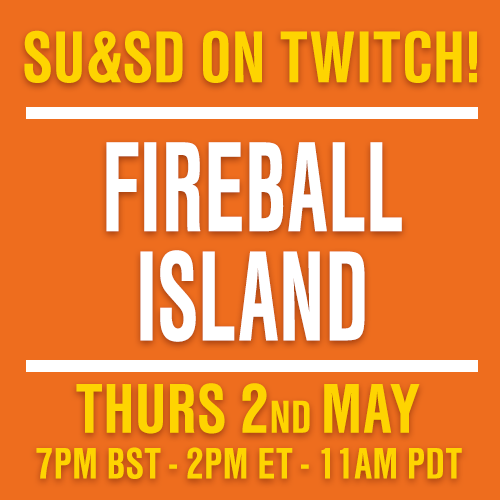 flipships, SU&SD Recommends, Dexterity Games, New to Games? Paul: The aliens are coming. Aggressively advancing, ever encroaching, nothing seems to stop their dreadful descent. The sunlight shines off their silver spacecraft as they pierce the heavens and prepare to bring down so much death and destruction onto the city below. You and your friends are all that stand in their way. Together, you will use a small flight of fighters and the most precise cardboard-flipping skills the galaxy has ever seen to win the hour. You will flip them round the moons. You will flip them in low orbit. You will flip them in the atmosphere. You will never surrender. Or you’ll flick a state-of-the-art starfighter straight across the room and lose it behind the sofa. Who’s to say? Flipships is ridiculous. Jostling for a place amongst the very best dexterity games, it knows that its peers are fundamentally very silly. For all its stats and magic items, Catacombs is nail-cracking nonsense, making its players flick wooden monsters into each other like budget billiards. Flick ‘Em Up aims straight for the eight-year-old inside all of us. Cube Quest is barely contained chaos. Each is a delight. Its pitch is one line: slapstick space invaders. A tableau of alien spacecraft waterfalls its way toward you, bombing your city if they manage to reach it. 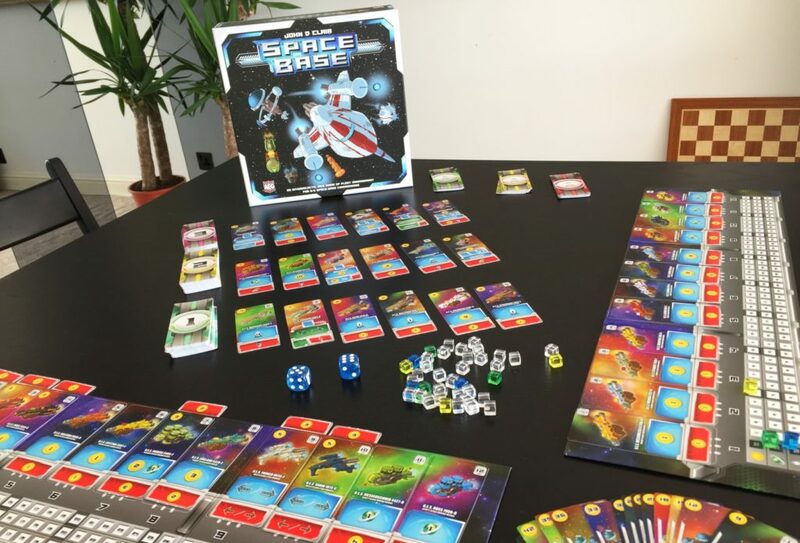 The only way to stop them is to flick small, circular fighter counters from the edge of the table so that they land on top of the cards that represent these spaceships. The trick is that you must send these counters up in an arc. What comes up must come down. In fact, the rules insist: they must flip. If you think this might be difficult, then you’re right. You’ve never been so correct. The ability to precisely flick light and capricious cardboard counters in pleasing parabolas is one of those skills you never knew you didn’t have. Not until all your friends were watching, anyway, and now they definitely know how bad you are. You flick too gently, trying to show restraint, and your fighter falls short. Even when your estimation improves, your accuracy is dreadful. It turns out that cardboard is the worst weapon with which to fight attacking aliens. But hitting the enemy is only half the problem. You also have to hit the right enemies. 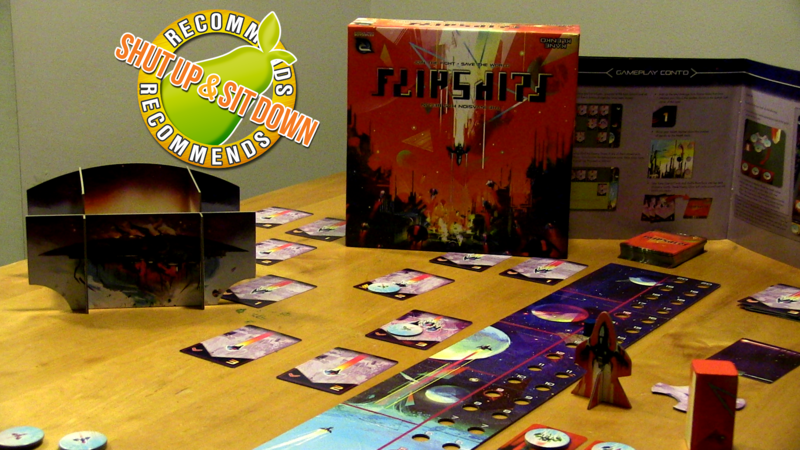 Flipships is very, very light on mechanics, but it deploys them expertly, like a subtle seasoning added to a simple soup. After you and your friends have flicked to the full, flipping your ships onto aliens that, hopefully, you’ve now eliminated, the rest of them get to move according to some very simple yet constantly threatening programming. From the closest spacecraft first, each slides a certain number of spaces down that tableau. Some just inch one spot, others glide three and might be on the verge of striking in just one turn. Some craft need multiple strikes to destroy, others shield their neighbours and the worst, the very worst of the bunch will push whatever is ahead of them, angry alien commuters shoving whole columns in one go. With only four spaces before the threat is upon you, there’s no time to waste. Hitting any old alien is rarely helpful, you need to take out those that could cause a cascade of chaos. Hold on, is this flipping game getting a little… cerebral? And since these spacecraft are dealt out of a shuffled deck, a new row every turn, they often appear in the cruellest of combinations. You’ll find a shielder protecting a pusher that’s about to shift two more craft straight toward the fearful, upturned faces of those below if you can’t take it out right now. Even success is fleeting: punching holes in the alien’s ranks often causes them to realign in new, equally challenging configurations. Things can get hard fast and lulls are few and far between. Fortunately, the city has at least some staying power. With twenty hit points (and alien craft inflicting different amounts of damage), it can take a few hits before it begins to buckle. As those hit points drop, reinforcements arrive and the number of ships you and your friends can flip increases. You also unlock new special abilities, all of which are as straightforward as they are helpful: more damage inflicted; the ability to take out multiple spacecraft, should your counter land across multiple cards; more flips if you take on the mothership. Like everything in Flipships, the mothership is both very silly and yet also a significant challenge that deserves your respect. In other words, its four pieces of cardboard that you need to land your fighters inside. It has a variable number of hit points, depending upon the difficulty level you choose (also determining how many aliens attack and how resilient the city is), and it sits behind the advancing aliens, leering at you from orbit like a manky space bin. You’ll learn to hate it. Of course, your enthusiasm for a cardboard mothership is going to be directly proportional to your enthusiasm for repeatedly flicking counters into the air and cursing as they land a few frustrating inches short. 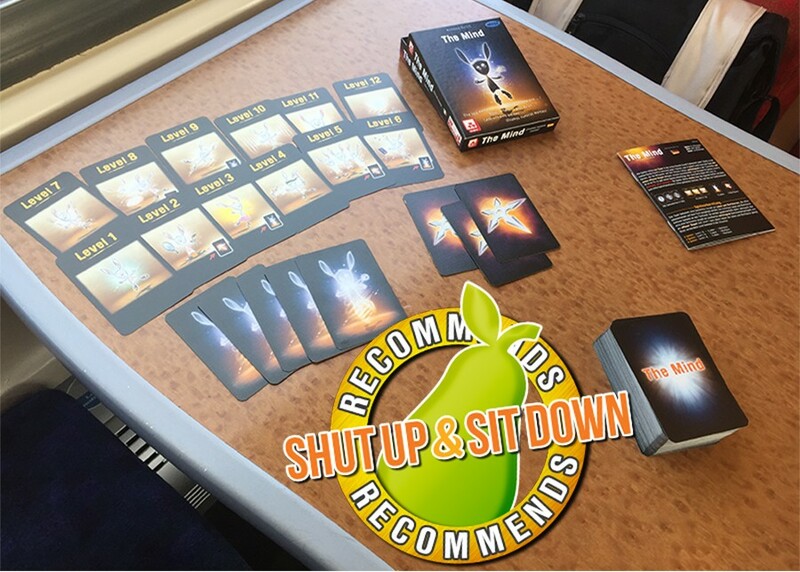 Flipships constantly challenges both your deftness and your decision-making, as its murderous momentum means each game’s stakes tend to rise very rapidly, but it is also a game mostly about flicking and whose outcome will always, always be decided by dexterity. Not everyone is going to like that. Then again, if you didn’t enjoy games this daft before, did you expect Flipships to change your mind? C’mon, this is basically a team of desperate fighter pilots flinging themselves drunkenly into space. Imagine the trench run with tequila shots. Hoth on highballs. Have you ever seen The Last Starfighter? It’s a very cheesy eighties film about a kid who becomes so good at a starship video game that he’s recruited by aliens to fly a real starship and help them defend their homeworld. It’s really not bad, in exactly the same way that plain crackers are completely okay foods to eat in a pinch. I sometimes wonder if Flipships is a little bit like that. Except, instead of a video game, aliens are waiting for one of us to master what is a very, very elaborate evolution of those stupid pub tricks where you flip coasters. They’ve garnished things with all sorts of extra rules and logic challenges, but there’s no hiding those wonderfully dumb fundamentals. It all comes together so well, far better than I would ever have expected, and its flatness seriously belies how much fun it is (it’s the most two-dimensional dexterity game I’ve played and I’ve used gifs here to try to illustrate play, since pictures of so much static cardboard just doesn’t do it justice). 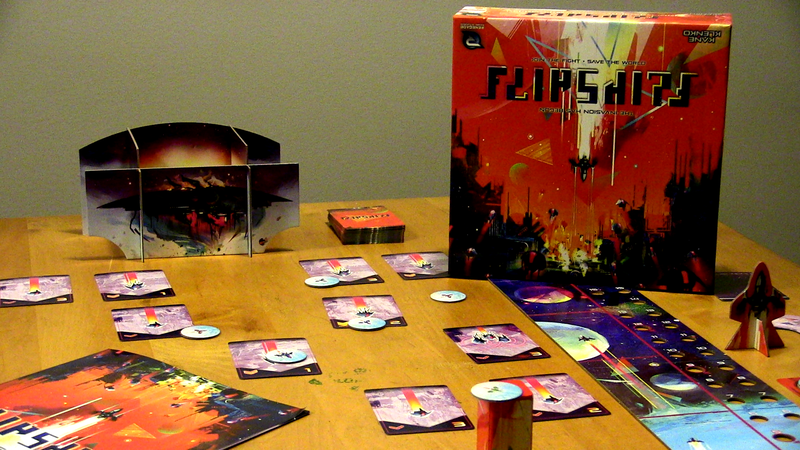 Flipships is flipping good precisely because it marries such a dumb dexterity challenge with just the right amount of mechanics and momentum, giving you so many moments where every flick counts and where game-saving shots elicit well-deserved cheers and fists clenched in victory. Never in the field of human conflict was something so silly also so darn hard. I don’t think it conquers Catacombs and, despite being stylish and dapper, I don’t think it has as much character as Flick ‘Em Up, but it’s still won its place among these stars. I’ve barely a bad word to say about Flipships (Eek, quickly! Er… I wish there were more ship types? And special powers? Or more game modes? What it most needs is more variety, expansions will hopefully fix that!) and I think it’s going to become one of my regular party games, hitting the table every holiday. 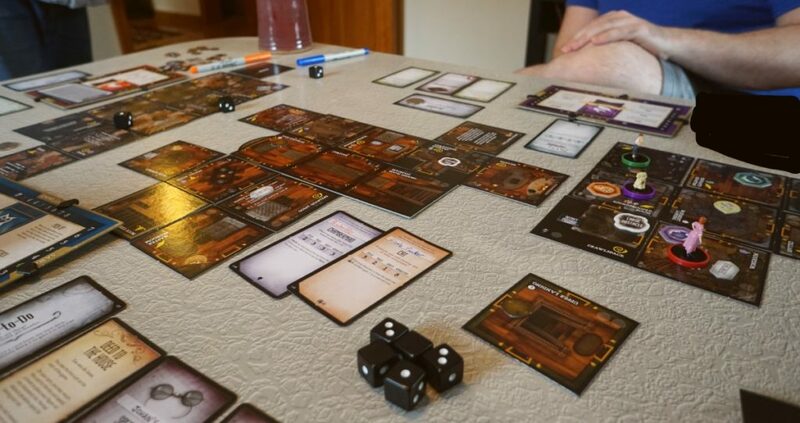 If you’re on the hunt another crowd-pleasing dexterity game, and if you’ve had your fill of fantasy or the wild west, I thoroughly recommend that you flip out.